He knew more people shared the same interest, but there was no good way yet to connect everyone. And that's how he got the initial idea of creating the online platform for this which he called Postcrossing. Its goal: to connect people across the world through postcards, independently of their country, age, gender, race or beliefs. In a matter of days many new members joined from countries all over the world, overcoming Paulo's best expectations for the project. 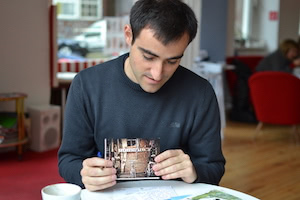 At this time, Postcrossing was still hosted in an old home computer tucked away in a storage room in Paulo's home. But soon it became clear that what started as a pet project was quickly turning into a very popular idea. Since then, Postcrossing has been in the media spotlight around the world, from the widely known BBC News to newspapers, magazines and blogs in languages and scripts that Paulo can't even recognize. In 2010 the Little Mail Carriers were sent to travel the world and report back on what they found. For Postcrossing's 5th birthday, postcrossers were invited to celebrate it by sending in photos of them posting their postcards. The response was both touching and overwhelming. In 2011, the Dutch postal services (PostNL) created the first Postcrossing themed stamp. On 17th of November, the new stamp was launched at Postex 2011 where the first stamp sheetlet was handed to Paulo. Many other stamps followed. Starting in 2013, Postcrossing partnered with Deutsche Post in a Postcards for a good cause campaign. For each Postcrossing postcard sent from Germany in December, a donation is made to a non-profit organization. Every year, postcrossers rally to send postcards which generate thousands of euros, contributing towards increasing literacy - especially among children and adolescents. In 2014 Ana presented Postcrossing in a TEDx event in Porto. The best way to understand how great it is to get a postcard from a stranger is... to get one! So, Postcrossing made a call to postcrossers from all over the world to send postcards to surprise the participants of the talk — and surprised they were! Postcrossing members continue to organize meetings across the world, sometimes traveling across the planet to join other postcrossers on meetups. And they keep getting creative — there's even meeetups in unexpected places like desert islands, trains and boats! There are even simultaneous meetups that connect across the internet to say hello to others. Today, the Postcrossing Project is directed by Paulo and Ana who work on it everyday with the precious support of a small team who help run the project's website and its forum. The members also play an important role with keeping the website running by helping support the project and giving feedback and suggestions about where to go next. For the future, the Postcrossing goals are simple: to connect the world through postcards and to bring smiles to as many different people and countries as possible. Happy Postcrossing!